I recently had the chance to read and review a book that has become near and dear to my heart. 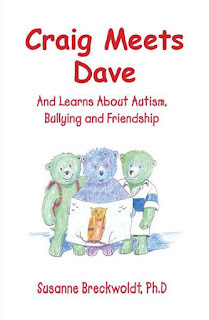 The book is titled "Craig Meets Dave - And Learns About Autism, Bullying, and Friendship." It is written by Susanne Breckwoldt, Ph.D The opinions given are entirely my own! The main characters in this enjoyable story are cute bears! Craig, Ben, and Dave are good friends. Dave is different from the other bears because he has autism. Dave doesn't like loud noises and doesn't like being touched by others. With Dave being different from other children, some of the bears start bullying Dave. When those bears notice Craig and Ben being nice to Dave, they start hurling insults toward Craig and Ben. They threaten to do something harmful to Craig's sister Emily. You'll have to read the book to find out what happens next! This book is great for any Elementary grade. The chapters are short enough to even hold a Kindergarten student's attention. It is also very relatable to children who have been a victim of being bullied, been a bully themselves, or helped a child who was being bullied. Using this book as a read aloud would spark great discussions on how how to handle a bully and what it feels like to be bullied. It may help stop it from happening in your classroom! If you are interested in checking out the book yourself click on the picture above! I am also pleased to announce that Dr. Breckwoldt will be doing a guest blog in the future to talk more about the book. If you have any questions for her regarding bullying, autism, or friendship please leave your questions below in the comments. She just may answer some of them for you! As always keep smilin' and thanks for hoppin' by Hopkins' Hoppin' Happenings!